Mix the turkey, bread crumbs, cheese, egg, garlic and 3 tablespoons pesto in a large bowl. Season with the salt and black pepper. Shape the turkey mixture into 36 (1-inch) mini meatballs. Heat 2 tablespoons oil in a 12-inch skillet over medium-high heat. Add half the meatballs and cook for 10 minutes or until well browned on all sides. Remove the meatballs from the skillet. Repeat with the remaining oil and meatballs. Sprinkle the flour on the work surface. Unfold the pastry sheet on the work surface. Cut the pastry sheet into 3 rectangles along the fold lines. Cut each rectangle crosswise into 12 (3/4-inch) strips, making 36 in all. Top each meatball with 1/4 teaspoon pesto sauce and 1 pepper half, cut-side down. Wrap 1 pastry strip around each and press the seams to seal. Place the pastries, seam-side down, into 36 mini muffin-pan cups. Bake for 15 minutes or until the pastries are golden brown and the meatballs are cooked through. 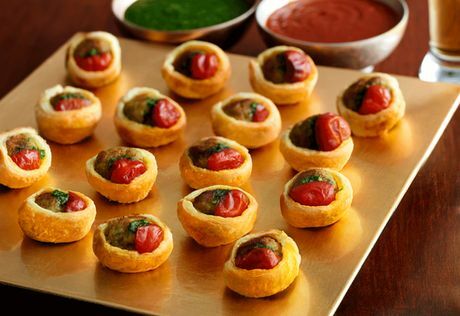 Serve with the remaining pesto sauce and the marinara sauce for dipping.